Need ideas for quilting this!! Thread: Need ideas for quilting this!! 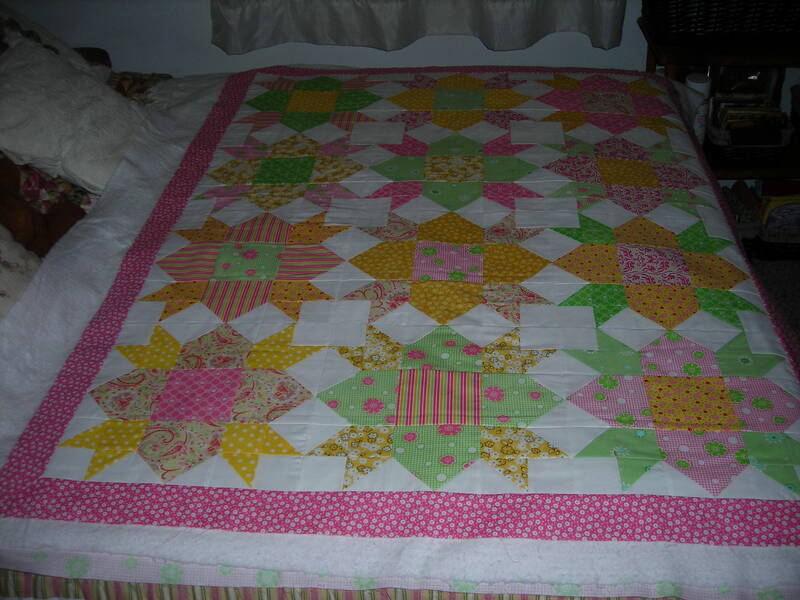 This is a baby quilt for a great-niece - it ends with the pink border. I need ideas for quilting it on my domestic machine! I'd like to to do something a little more detailed that stippling or loops & swirls. How about a flower with echoing in the center squares and maybe a leafy vine on the borders. The rest I don't know what to suggest. No ideas, I am fairly new at quilting, but wanted to say I love the quilt! I agree with tezell0801.... I'm too new at this to advise, but I love the quilt. I especially love how the white squares, straight and diagonally, really help the quilt pop! Great job! I often do arcs on the squares, rectangles or what have you. You can usually find a method that makes it continuous so you don't have to stop and start so often. Just make an arc on each side of the seam. It makes a pretty design on the back as well. Like joyce888 suggested...maybe a flower in each center. Pretty top! I think I might get the tear away star block papers in continuous designs to fit in the blocks. I would then look for a border star pattern for the border. Great quilt. I hate deciding what to quilt. Wouldn't life be easier if quilting patterns came with a giant stencil to lay on the top for the quilting? Flowers in the center blocks, as suggested above...with hearts on the four surrounding...they are perfect shape for them. You can do an opposing heart in the four corners...and I love swirls on white blocks. Very pretty quilt! I think this idea would look really good!!! Great quilt!!! Great ideas! Very pretty quilt, too! Good job! Adorable quilt! Can you share pattern info please? Thanks! The quilt is beautiful and I have no suggestions, but, love your idea!!!! Briar Patch pattern from Connecting Threads. I just made the center portion for the baby quilt. I will definately make the whole pattern again! Glad you liked it! I'm not very experienced with quilting but love the quilt. Is this block the "weathervane"? I usually start with how densely I want it quilted...if it's an everyday throw for a chair, and will be used a lot, then I would just outline all of the blocks and do a simple motif in the empty white squares...so the quilting will be balanced. If you want it for more of a show piece, then heavier quilting ...I see you are using the pink check with green flowers for the backing..so maybe an enlarged version of the green flower, and do something like vines and leaves with that flower in a wavy line on the borders? Anything you do will only add to it's beauty, so try not to stress too much..it will look great when it's done, you can't go wrong when you start with such a pretty top! Post pics when it's quilted! Beautiful quilt!! I agree with the flowers in the center but am stumped as the what else to do. Sorry I'm not much help. I recently had a baby quilt done at the shop. The quilter chose swirlies with occasional animal outlines - elephants, etc. I was pleasantly surprised and pleased with her choice. Gorgeous quilt!! I'm never sure how to quilt them myself. Looks like we're in good company!